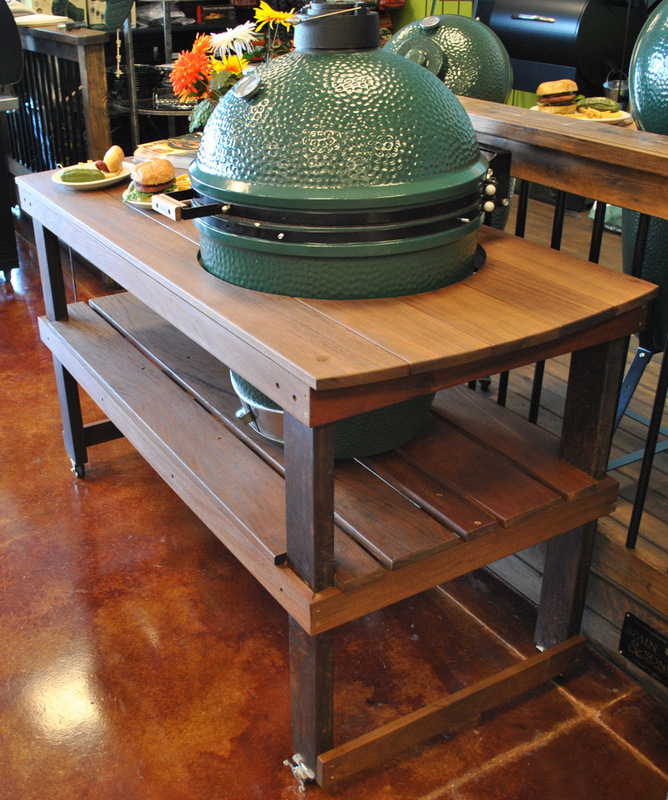 Outdoor kitchens and hot tubs need some special considerations.There are many articles on outdoor kitchen and spas. This article is just to highlight a few of the unique issues when placing these features on your Ipe deck. Kitchens are heavy. This is not a problem with the Ipe, however you will need to plan more foundation beneath the kitchen. Plan for more joists, potentially more footers. Utilities: If you have gas in your house you should plan to add a gas line. If you do not realize it yet, gas lines are not for the DIYer. You may not have gas but may want propane tanks. Again, where will they be placed and how will they be accessed. You will also need electrical. An outlet at a minimum. Lights and possibly refrigeration. More elaborate systems have vent hoods. Be sure to include safety such as GFCI systems as your outdoor kitchen area will be, well outdoor and subject to rain and humidity. Placement: When planing the placement of your kitchen, we have seen several where the kitchen was an island. This is great as many of your guests then will gather around and help. This arrangement really becomes the focal point. This does not mean for your island kitchen to be in the center of your Ipe deck. It just means you can plan for access from several or all sides. Roof: Another idea is to have your kitchen area under a roof. What happens if an unexpected rain appears. Your guests can go inside. Moving a dozen racks of ribs may not be an option. Think of some type of covered area to keep your food out of the weather. A roof is great for lighting over your cooking area. If you have a roof, think about ventilation. Spas, Jacuzzis and Hot Tubs have several of the same issues as Kitchens. They are heavy an need utilities. Weight: Similar to kitchens you should plan for the extra weight. This could be extra footers and extra joists. Do not underestimate how much these products weigh. An 8×8 spa that holds 6 people could hold between 400 to 500 gallons. So 500 gallons of water weights about 4150 pounds (2 tons). Add 6 people averaging 150 pounds each and we are up to 5000 pounds. A Ford Explorer SUV does not weigth that much. Imagine parking your SUV on your Ipe Deck and you can imagine how much support you will have to build under it. Remember, unlike your car, your hot tub does not move. Your Ipe Deck will have to support that weight for decades. 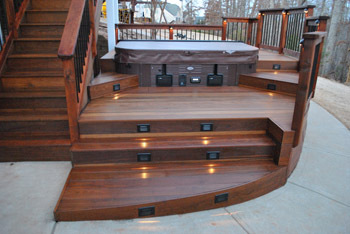 Placement: Usually Spas are not in the center of a deck unless they are the focal point of a small deck. Your hot tub can be placed on the deck or you can easily build it into the deck. Into the deck allows easier access for entering and exiting. Just beware and do not make it a tripping hazard. 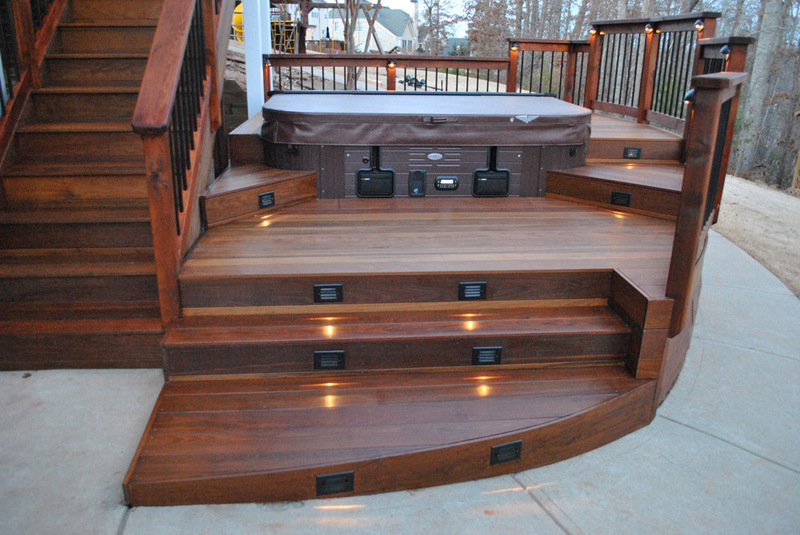 If you place your Jacuzzi on your Ipe Deck you can create a few steps to allow easy walk up and over into the water. Also, the steps have a duel role allowing people going in or coming out to sit. Chemical Storage: Spas use all types of chemicals for ph balance, killing germs, and so forth. You will need a place to store them. On the deck may not be the right place. However, it is good to start keeping in mind where you will store them. Maintenance Access: Most new spas have access panels for maintenance. If your hot tub is atop the deck you will not have a problem. If you build your Spa into the deck you need to make allowances. If the deck is high off of the ground you will need to add access removal of deck pieces to allow maintenance. PLAN THIS IN. You do not want to wait until a problem and discover you have to remove portions of your deck to fix it. Utilities: Like Kitchen, your Ipe Deck spa may need gas lines and will definitely need electric. Some spas need 220 Volts. Again, Gas lines nor 220 Volt Power are tasks for the DIYer. Plan and budget to hire a pro. I think these Fire on Water pits are great on an Ipe Deck. If you have a gas line to your home you are already 40% there. Now you just need a deck. The secret is piping gas below the water pit. Once the gas emerges from the water just light it up. Utilities: Gas line is a must. Again, this is not for the DIYer. Hire a pro. This is something many people talk about. An adult tree-house. I doubt there is any better wood than Ipe. Ipe will allow the tree house to last as long as the tree. Some considerations include creating the foundation and support from the ground. The tree may not be a good long term support for a living structure. Many of the above issues should be reviewed. The need for electricity being a main one. As the structure will not be attached to your home a check with the local Electrical Code would be in order. Usually there is a exemption for an out-parcel structure but it is best to be sure. Expect to put in a sub-panel and GFCI breakers. The expense and complexity of an Adult Ipe Tree house usually requires an architect to keep up with local zoning and codes. You should probably have one involved from the start of the planning stages. If you decide to do a tree-house with Brazilian wood, please call. We would love to be a part of the project.